NEW AMSTERDAM, BERBICE - Commander of Division ‘B’ of the Guyana Police Force, Assistant Commissioner, George Alexander Vyphuis was loud in praise to the business community for the support they have been giving his team. This, he cited as one of the reasons for a reduced crime rate in Division ‘B’. From January 1st to June 30th, 2009 statistics show a 16 percent drop in criminal activities in the Ancient County, when placed alongside the 2008 figure for the corresponding period. Earlier in the year, Vyphuis had condemned the laidback attitude of some business entities towards the safety of their concern and staff members. Back then, at some entities, security was lax and others say it was non-existent. Over the weekend, the Commander said there has been a remarkable improvement in safety measures at business entities in Berbice. This sentiment was also expressed last Thursday at an Inter-Faith Church Service at the Central Police Station in New Amsterdam, to kick off activities in Berbice to mark the 170th Anniversary of the Guyana Police Force. At the function, the Commander spoke of the need for the public and police to work in tandem to achieve one common goal, a society with minimal crime. Vyphuis commended his ranks for what he described as a sterling job done in bringing crime in Division ‘B’ to an all time low. He also encouraged them to respect the public for it is the very people who they must serve. The citizens of Berbice also came in for praise. 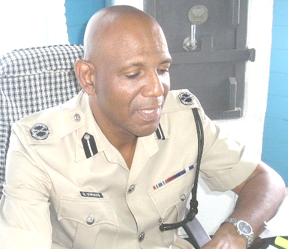 The Guyana Police Force is stepping up its community-oriented programmes to maintain close relationships with the public, in addition to the reduction of crime. Among them are the Community Policing Groups, Neighbourhood Police ranks, Station Management Committees, Traffic and Crime Advisory Committees, Board of Training, and the Community Outreach Programme. So far, several outreach programmes have been held in East and West Berbice. The recent ones were at Lovely Lass on the West Coast of Berbice and on Saturday the Commander visited the New Amsterdam Market where he had dialogue with vendors. Sometime later this week, members of Division ‘B’ of the Guyana Police Force, along with the Central Police Station Management Committee would rehabilitate a bridge in the Angoy’s Avenue area. The Police Youth Clubs and the latest initiative, the Scout Movement are also a part of the drive to foster good police/public relations. Assistant Superintendent Stephen Mansell, who is in charge of the Number Three Sub-Division, established a Scout movement on the West Coast of Berbice earlier in the year and from all reports it has made a huge difference in the lives of the members. Other activities in Division B to mark the 170th Anniversary included a mass patrol across East and West Berbice on Friday evening last. A fitness walk is planned for July 12th. The nine-mile trek starts at the Borlam Turn and winds up at the Central Police Station in New Amsterdam. A day of games is scheduled for July 15th at the Felix Austin Police College Division ‘B’ at Adventure on the Corentyne.